This has been a great summer for me, culturally, gastrologically, and in terms of business. 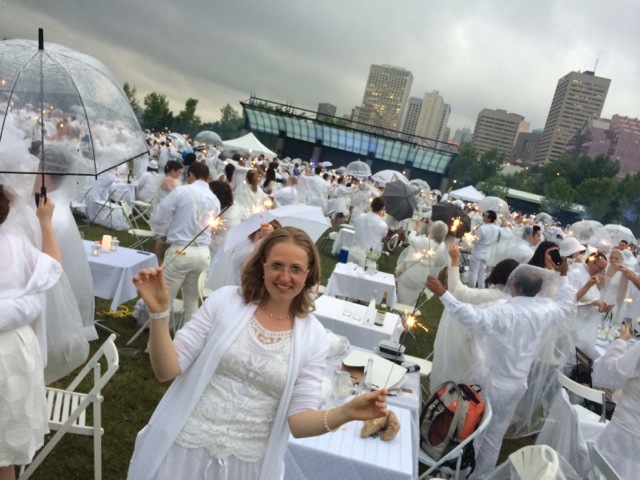 I was #2 in the office for the month of July based on commission, and I have attended some great events, including Dîner en Blanc, Folk Fest, and Arcade Fire. A common theme for these events was “what to wear”. Folk Fest is obviously quite casual, so nobody stresses too much over what to wear. The other two, however, are a different story. I first heard about Dîner en Blanc thanks to Carmen Douville and Christina Ignacio-Deines, and was immediately intrigued. I found some lovely photos and videos of other DeB events around the world and knew I wanted to attend. And then I started to read some of the regulations about it. Whoah! This thing is pretty strict! 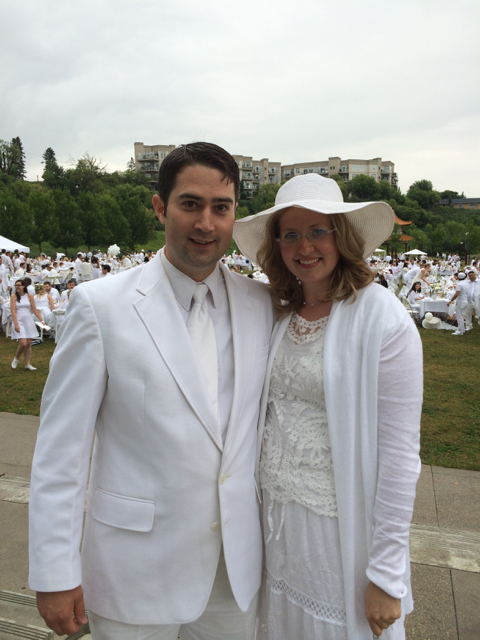 All white clothes, not even ivory or cream or mother of pearl. All bags and related items used to transport your gear (you were required to bring your own table, chair, cutlery, and food, unless you bought a meal plan through the event’s website). You may even be refused entrance for infringement of any of these rules and banned from attendance in the future. These rules, along with the fact that the individual entrance fee was $35, turned Dîner en Blanc into a bit of a joke for some of my Facebook friends who clearly would not be in attendance. To think: we were expected to pay for transportation, security, setup, sound and light setup, and entertainment. And food wasn’t even included in that?? Unfathomable! Preposterous! A rip off! Actually, it was entirely fair and reasonable. Enter Arcade Fire. What a great band! When they announced they were coming to town I thought that was pretty awesome. I learned today that it had been 9 years since they last graced us with their “heart-bursting sonic explosions”, at Red’s of all places. In Ticketmaster’s not-so-fine print, one learns of a dress code in effect by the band. “Formal attire/costume”. Uhh, what? This is a rock show, not Hallowe’en, Mr. Butler. How pretentious could one singer-songwriter be, anyway? His vision and purpose was all made clear to me last night. First, he raised the bar for concert-goers. The more you put into something, the more you can expect to get out of it. Second, he provided us a way to be united that goes well beyond just being in the same building to hear the same songs at the same time. Everyone was in the same boat, and I think that was cause for a lot more friendly smiles, especially for the guy in the red robe wearing a gold crown, not to mention the pirate guy and Elvis. Lastly, he was truly grateful for everyone’s effort and complemented us, particularly those with sequins. Maybe he’s part magpie. 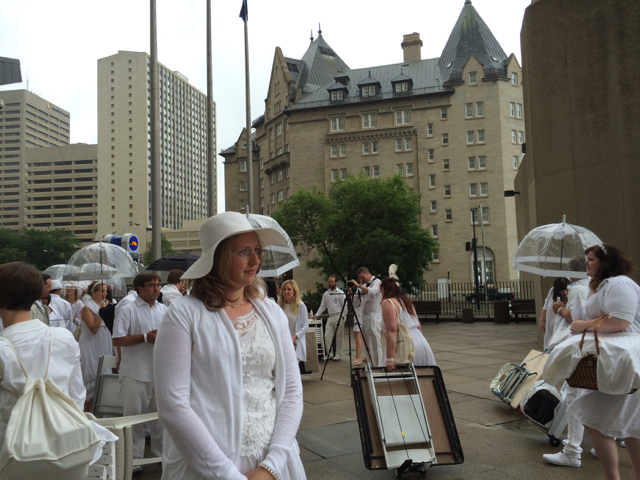 Coming back to Dîner en Blanc, I find a lot of parallels between it and the Arcade fire concert. Both raised the expectations of participants. Both events united us simply by asking us to follow a dress code.